..has been carefully curated to reflect the issues of divided communities within Israel and Palestine and to promote reflection and prayers for peace. ..seeks to explore aspects of human rights and dignity. It has been put together on the basis of principled impartiality, putting concern for human rights above support of any particular group by referring to international law. There is no criticism or judgement of the Jewish community or faith. What manner of “principled impartiality” singles out the State of Israel? By all means criticise its government’s immoral policies and abhorrent actions, but no church should draw attention to human rights violations or injustices by demonising that state alone, for when they do so they are holding it to a higher standard of political morality and ethical rhetoric than they do other nations. What about Somalia, Burma, North Korea, Iraq, Syria, Afghanistan or Libya? What about China or Saudi Arabia? Shouldn’t Christians be even-handed about these things? Shouldn’t they be generous in their understanding, and compassionate in their spirit? Why aren’t critics of Israel consistent in their condemnation? Or is it simply that a tourist trip to Bethlehem is easier to arrange and safer to enjoy – precisely because the Israeli government prioirtises the security of its people? There are quite a few peaceful, prayerful reflections in the visitor’s book. One reads: “IDF soldiers are the scum of the earth. 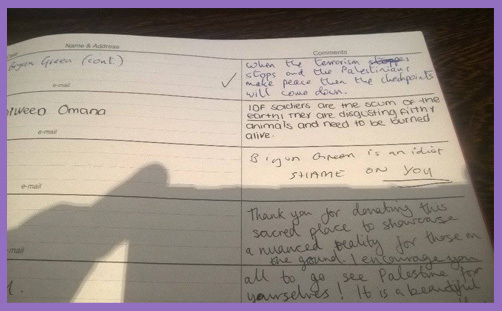 They are disgusting filthy animals and need to be burned alive.” It is signed by someone called Omana, who clearly thinks the proper place for Jews is in ovens. Hinde Street Methodist Church may not believe they are fanning the flames of anti-Semitism, but they seem content to hand out free kindling wood and matches to Jew-haters. When the Methodist Church boycotts the State of Israel uniquely; when it erects exhibitions which focus on Israel’s alleged injustices uniquely, the church is manifesting an anti-Semitic attitude. Whatever words of peace they preach, and whatever assurances of prayer they give, they are sustaining a vile history and supplying an abhorrent industry. This has no place in any Christian church.